On October 16, Charge d'Affairs a.i. 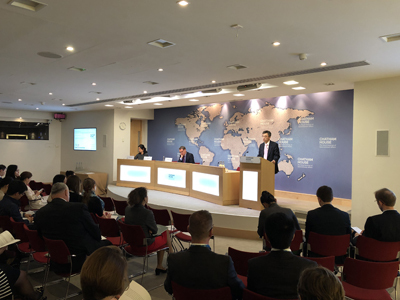 Zhu Qin attended the Belt and Road Conference and delivered a keynote speech at Chatham House, London. More than 160 people including Lord Jim O'Neill, former Commercial Secretary to the Treasury, Lord James Sassoon, Chairman of China Britain Business Council, and representatives of institutions including Asian Development Bank, European Bank for Reconstruction and Development, HSBC, US Center for Strategic and International Studies, and the British Broadcasting Corporation attended the conference. Zhu noted that the Belt and Road Initiative, which is widely welcomed and acclaimed internationally, leads the trend of the times, serves the shared interests to people around the world, and is highly inclusive. Over the past four years, the Belt and Road has made steady progress, resulting in quite a few bilateral and multilateral cooperation agreements, flagship infrastructure projects, and trade and investment outcomes. As the global economic growth picks pace and gains momentum and China's economy grows steadily, all participants of the Belt and Road are working closely to identify new drivers of growth, explore new space for common development, and achieve new success in Belt and road. Zhu pointed out that the UK is China's key partner in building the Belt and Road. China and the UK have a solid foundation and broad prospects for cooperation on the Belt and Road. The two countries can work more closely together to reinforce policy coordination, match up their respective strengths, and strengthen Belt and Road cooperation in the field of financial services, law, infrastructure, science and technology, and cultural and people-to-people exchanges. Belt and Road cooperation can become a new highlight of China-UK "Golden Era". Zhu emphasized that in the nearly four decades since the reform and opening up policies were adopted, China has found a development path that suits its national condition. While China is committed to developing itself, we are also working to make sure that our development delivers benefits to people of other countries. The Belt and Road is an epitome of China's contribution to the world. The 19th National Congress of CPC to be held in Beijing will produce far-reaching impact on the development of China and beyond, inject a new impetus to the Belt and Road Initiative, and create more "golden opportunities" for the development of the world. Zhu also answered questions from the audience on the investment mechanism and risk management of the Belt and Road, and gave an interview to Phoenix Television. 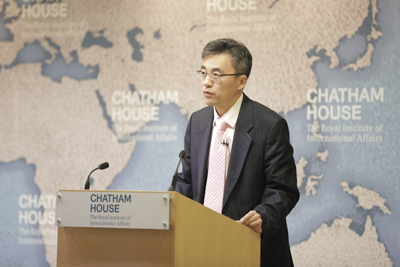 Chatham House, the Royal Institute of International affairs, established in 1920, is a world-renowned think tank. The conference focuses on China's Belt and Road Initiative and its implication for the global economy, and the opportunities and challenges on building the Belt and Road. The participants of the conference generally believed that there are great potential and broad prospects for cooperation on Belt and Road and expressed their willingness to seize the opportunity to jointly promote the Belt and Road Initiative to produce more outcomes.